“You know my biggest beef with this book?” my husband asks as he rolls over on his side and props his body up next to mine. We are reading The Meaning of Marriage: Facing the Complexities of Commitment with the Wisdom of God (Penguin, 2011) by Tim and Kathy Keller for a marriage class we’ve only attended once. I can think of a number of beefs I’d chuck out of this tome. But I can’t think to which one my earnest, and far-less-critical, partner might be referring. We have a history with the Kellers. One of the pastors who married us over six years ago required us – as part of our pre-marital counseling – to listen to the marriage sermons Tim preached at Redeemer Presbyterian Church in Manhattan. Even then as wobbly-kneed 22- and 24-year olds we sensed differences from the long-time pastor in our approach to marriage and interpretation of Ephesians 5. Namely, Tim appears to hold the belief that men and women are essentially different, created different and called differently. I imagine Kathy may feel the same way. I don’t recall hearing her voice on any of the recordings. The Amazon page for the book lists Tim as the author, Kathy as the collaborator. I understand Tim is the pastor. I understand Tim is the writer. I understand Tim is the sell. I understand why he gets top billing. What I don’t understand is why – if men and women are so fundamentally different – isn’t it that much more necessary for their perspectives to be shared equally in literature, sermons, and conversations? Too often I hear men in leadership speaking for and about their wives, mothers, and daughters instead of hearing from the lips and pens of those very women themselves. It is as if they speak with one (male) voice, as if gender difference doesn’t matter after all. I’ve been attending a new church this summer. I like the music, how the choir director stands up and explains why he’s chosen to play his oboe to Mozart. I like the people, how they pass the teal binder up and down the pew and smile at me when I scribble that I’m visiting. I even like the pastor, how he is genuine and kind and says my name aloud as I take communion. I nevertheless begin perspiring with dread when he talks about women — or doesn’t talk about women. In one sermon alone I noticed that women in all the examples were nagging mothers, hopeful girlfriends, or dutiful wives. During another I noticed that men were the only examples held to light. A male-driven sports metaphor carried the message. A male-driven exegesis explained how in ancient Judaism our circumcision would have been the mark of faithfulness. A male-theologian, C.S. Lewis, was quoted. A lot. The first time I heard a pastor talk about reading U.S. Weekly with her daughter in a sermon, I started weeping. A lot. Oh, and C.S. Lewis is quoted. A lot. Tim has been a pastor – with Kathy – for many, many, many years. I don’t doubt that these stories and examples resonate in both the reality and fiction in which he’s been immersed. But these persistent stereotypes are getting old. Continuing to recycle them only rehabituates the next generation into acting them out. How might these narratives shift with more nuance, fresh imagination, and a different (female) perspective? Funnily enough, Tim appeases all genders by calling Jesus our Divine Spouse when we all know that the Bible calls him our Bridegroom. The one time where a literal bride’s voice, Kathy’s voice, could have rung out is subsumed in singularity. 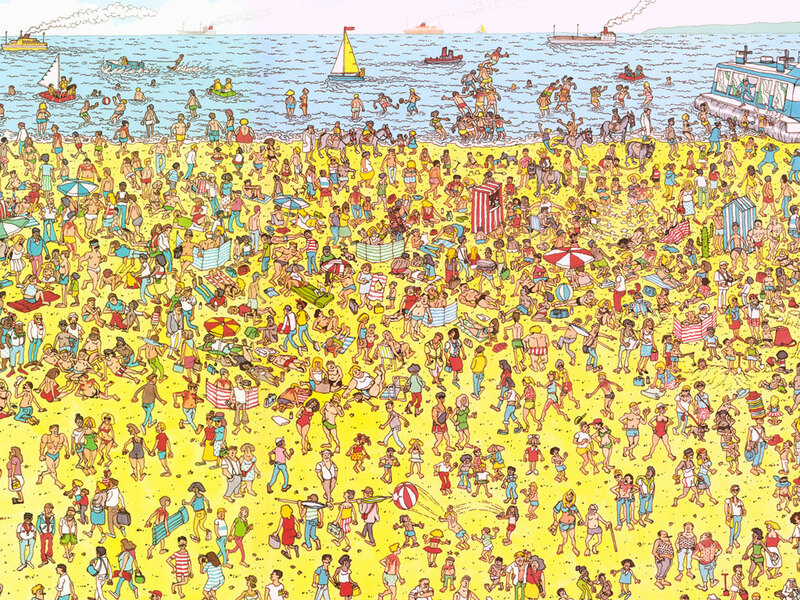 Searching for a woman’s voice in the church may be like searching the maddening red-white-and-blue of a Where’s Waldo? cartoon. But with enough patience we will find her standing, rather obviously, in the center of the picture looking straight at us with eyes bright. * Update: I found Kathy writing in her own voice in Chapter 6, the one about gender roles or Embracing the Other. While I don’t distinguish between gifts given only to men and only to women, I appreciated her sentiment that both men and women have Jesus for a model in their respective headship and submission. So why can’t we try to model all of him rather than just playing our part? Great point. It seems this has been a recent trend, for popular male pastors/writers to come out with a marriage book with their wives. Mark Driscoll recently came out with a book on marriage with his wife, Grace, entitled Real Marriage. John Eldridge also came out with a book on marriage with his wife, Stasi, entitled Love & War. Having not read either – and don’t really plan to – I do wonder how much voice the women get… and even so, is this really a good representation of how to have a healthy marriage? I do agree that each partner in a relationship brings his or her own unique gifts to the relationship, and it can be a beautiful dance full of great choreography and exciting, spontaneous moments… but it can also be challenging and frustrating to practice the steps. However, working together in tandem and sharing abundant grace with each other is the BEST THING EVER.